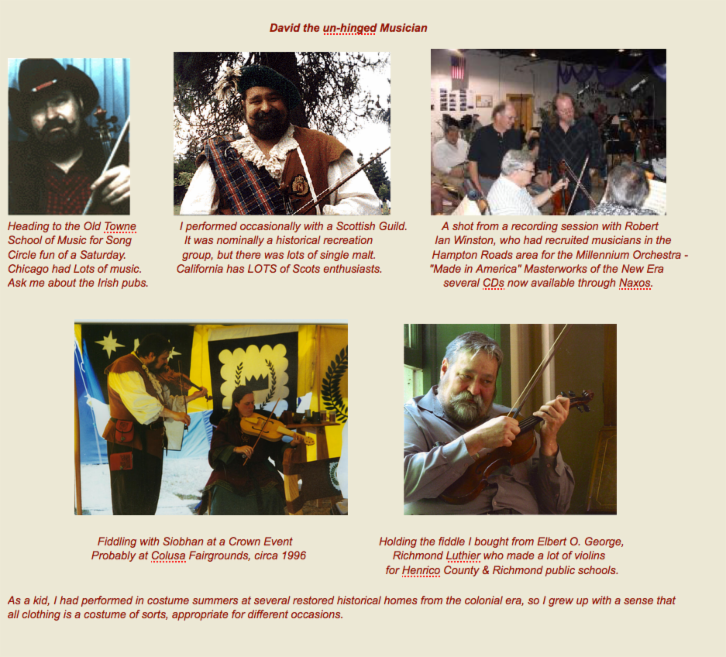 All works by David March shown here are shared for portfolio / demonstration purposes, and are fully protected by U.S. statutory and common law copyright. None may be reproduced without express permission. 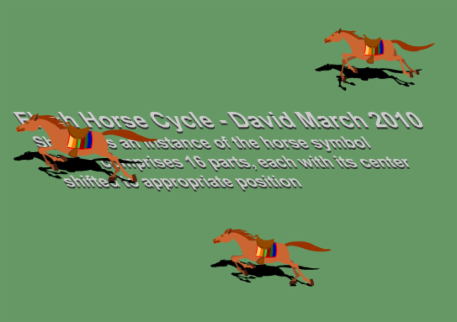 Additional images provided are the property of their respective copyright owners, and are shown to provide context for work produced by David March in fulfillment of assignments during his employment. received archival copies of the productions to which I'd contributed. about 8 little sequences that I had animated! After he returned from working with Hanna-Barbera studios in Australia, Jon McClenahan set up his own studio in Homewood, Illinois, about an hour south of Chicago's Loop and the "Magic Mile." Jon is a master of animation posing, timing, and acting, with far more experience in feature and commercial broadcast than my own modest resume lists. (You can find some great interviews with Jon online.) Just about the time he'd been awarded a 10-show contract from Warner, I met him after I'd been producing broadcast spots using computer graphics and 2D animation. Operating Quantel Paintbox® and working with the operators of the Vertigo™ 3D, I had worked out ways to combine my traditional animation experience with high-end graphic systems. The pages shown above are excerpts from the second of three 15-to-20 page workbooks I developed for workshops Jon asked me to conduct to acquaint new artists with the techniques and procedures we used at Startoons for the Warner episodes of Tiny Toons, AniManiacs, and Taz-Mania. He had hired me to supervise the assistant animators, and fill in as one of 8 lead animators, working on various projects. There were several spectacular animators and artists already working there - Spike Brandt, Tony Cervone, Kirk Tingblad, background rendering Artists Uttam Kumar & Stan Fukua and Mary Hanley with her immaculate drawings spring to mind. 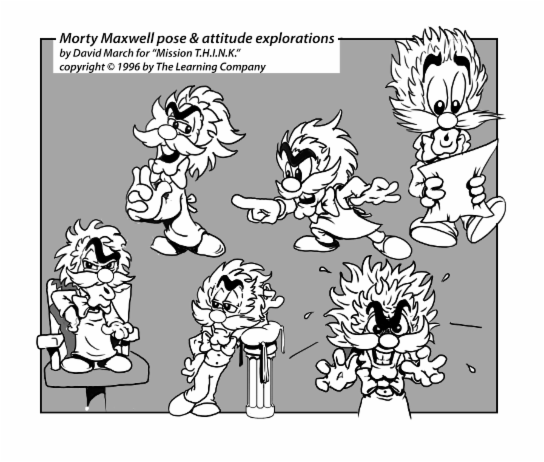 I really had to "up" my game, but I'd been animating by that time for over 20 years, starting with work I'd done for John Hubley and Jerry Strawbridge for their animation seen on Sesame Street and the Electric Company. It required breaking habits I'd learned producing a lot of low budget local spots and educational films - mainly a lot of distortions I'd learned early on producing low-budget local spots and educational films. That was crucial for me to learn how to extract the most juice from a budget. But forcing six figure drawings per second to cover the action of the so-called Disney standard of 12 figure drawings per second... well, that clamps limits on the sort of movement you can have. Before he hired me, Jon had me do a couple of freelance assignments, and he knew I had been teaching traditional animation and computer graphics classes in the Design School at University of Cincinnati, and at Xavier University. But I'd also prepared workbooks and conducted workshops and seminars for companies where I worked, and Weekend Workshops for people who were interested in animation. Earlier I had trained all the freelancers who worked with our bitty little studio in Virginia Beach. I still use some of those materials in the classes I teach, but these days there's such a wealth of wisdom, especially the DVD set of lectures given by Richard Williams hosted by Blue Sky Studios a few years back. 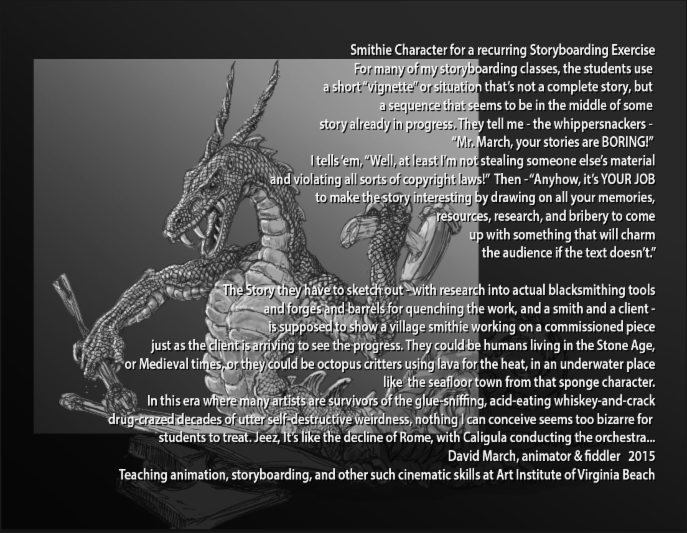 The brutal fact is that when I started doing animation in Virginia Beach in 1974 I had to train folks if I didn't want to do every darned thing myself. There were people interested in the craft, but there was only Steve Segal and Phil Trumbo doing animation in Richmond then, and no other commercial studios (as far as we knew) between Atlanta and D.C. The greatest thing was the first time I drove some film to the lab in Richmond, and everyone back at the studio was working just fine, knew just how to do all the things they were s'posed to! I've been amazed repeatedly at meeting people who were so determined to do animation that they damned well went ahead and figured out ways to do it, even when their schools offered NO training or classes. It has struck me that it doesn't require any special genius to understand most of the tasks of animation. 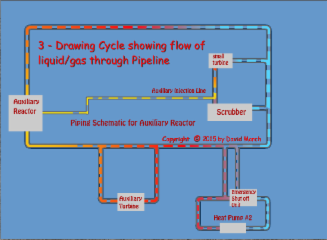 But it does take a while to see how all the parts fit together and how a decision in one stage will affect everything else downstream. I'm a utility animator - there are many artists with much more subtlety than I, but not so many who have operated a company, met with clients, worked out budgets and schedules to fit the quirky concepts and production techniques to get a message to a specific audience, then slogged through and delivered the thing. These are some additional images done for a City of Norfolk Public Utilities training project. 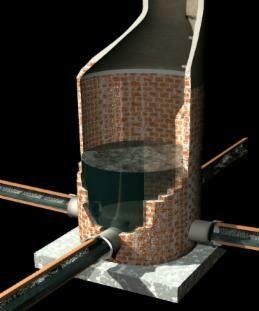 Producer Rick Voight needed depictions of the underground water transport structures that could not be shown by video or photography. 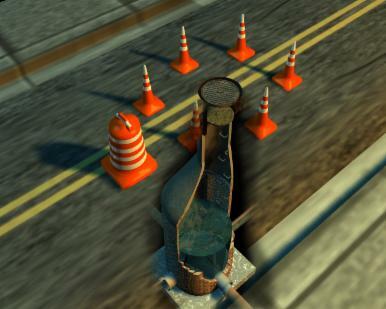 I used Lightwave 3D to build models in various levels of detail, to illustrate principles the trainees needed to understand in order to operate equipment at street level to address problems far below in the pipes and channels of the system. 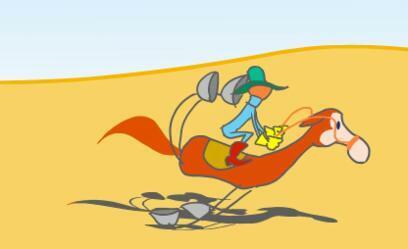 This was created as a demo of the Animation tools in Adobe Photoshop, version CS5, for students in Regent's introductory animation classes offered at the time in the School of Communication and the Arts. The course addressed basic principles of movement, timing, stretch & squash, etc., without requiring any specific software. Since Photoshop has become a standard tool for a huge range of activities, it proved to be a useful tool for treating tightly-framed animation exercises. Otherwise, we used Toonboom Studio, although a few students bravely investigated object animation, humans posed frame-by-frame, and even (*gasp*) animation on PAPER! There were 40 + folks on staff at Startoons' Glenwood studio, and they all worked with amazing passion, commitment, and humor. Several went on to the West Coast to work at other studios. Jon trained them well. The week I started, The Learning Company announced it had been purchased in a "leveraged buyout" by a new set of owners. It was a mighty educational experience watching the new owners buy up every single mid-level producer of children's educational software over the next three years. 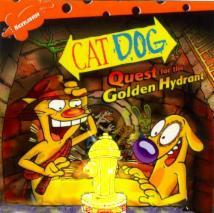 I spent about a year each on first Mission T.H.I.N.K and Cluefinders Himalayan Math Adventure. I used several 3D programs to build models for the teams to use as references and for props and game pieces for some of the games within the titles. Because of my two years of 3D experience rigging and animating for a fighting game at Atari, I'd been recruited to lead a team in The Learning Company to make a transition to 3D production, but the new owners had completely OTHER plans. Oh, well... As things unfolded, I ended up contributing to five or six Reader Rabbit titles, cover art for a few other products, even played my fiddle for a couple of audio tracks. The image below is from that first project. I did a lot of story sketches, and eventually animated Morty Maxwell and his robot minions doing all manner of evil deeds, while Rusty the Dog provided hints to the kids playing on how to frustrate his plans to take over all creation. 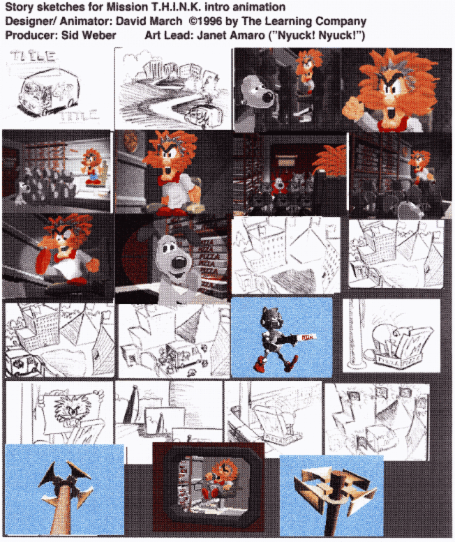 If I recall correctly, I did most of my actual animation in Photoshop, separating layers as I'd done on PAPER earlier in my career, then assembled the parts in 3DO. 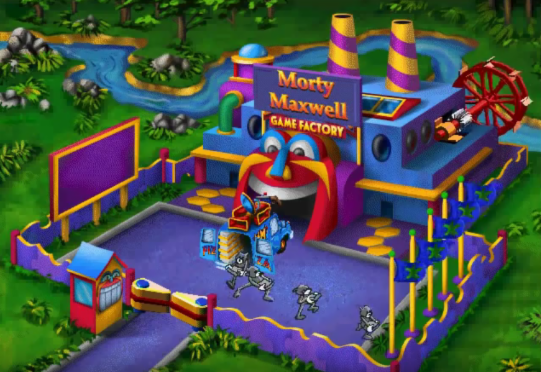 This Still image shows the factory Morty takes over, rendered by Novato freelancer Bryan Purse. 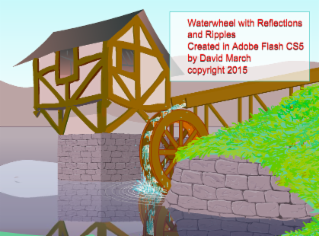 fer-Pete's-sake INFINI-D 3D software to create and animate the water wheel. ... And here are some of my initial story sketches done when in the first months after I arrived. This next one is the Last image I'll show from Mission T.H.I.N.K., I Promise! It's a shot of Rusty, Morty's rebellious robotic companion with an unexpectedly kid-friendly outlook. 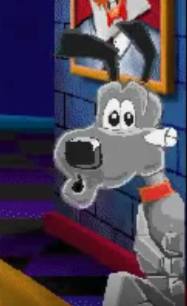 This one shows the influence of the time I spent animating characters for Warner's "AniManiacs" --- NOBODY ELSE uses that truly weird lower lip poking out like that for an "Ooooo" sound. Below: Cover art for two CD games for which I animated sequences as a contract worker with KNOW WARE. After TLC, I worked on several projects with a very small studio - "Know Ware" was started by several folks who'd been involved in The Learning Company, and used their experience to start their own enterprise. Mike Bailey, the creative and artistic director, was one of those polymaths who could design 2D And 3D animation and characters, and compose and perform music. He was a great director to work for - he gave excellent feedback and clear and specific critiques. After all the buckets of blood in the Atari arcade games, it was kinda refreshing to have the big crisis turn out to be a missing sippie cup. 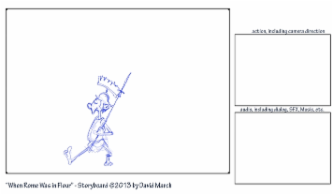 Storyboarding - Visual Planning - has been a major component of my career. It's what I studied in particular in college. 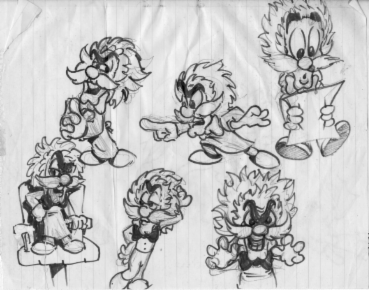 All the drawing I'd done for the 18 years before college turned out to have made animation almost as easy as breathing. But the actual PLANNING of sequences, and later - using the storyboard to help live producers, camera operators, lighting directors, casting directors, set designers, location scouts, and so on - to anticipate the challenges and solutions for scripts, all that comes from my training with John Hubley. My own career has had me working at a number of companies after I learned the basics of so-called traditional animation: some exclusively devoted to traditional animation, others including audio recording and production, still others with sound stages with crews that could build sets and produce full service programs with live actors, High-End 3D and 2D graphic systems, and multi-format video editing suites, finally, the arcade and CD games industries. During my undergrad years, the biggest flurry of excitement in the industry was enormous public extravaganzas of over a hundred carousel 35mm slide projectors, all controlled by a meticulously planned and coordinated program - driven by a Punched Paper Tape, like a Player Piano. Just a couple of years later, ad agencies, production companies, commercial studios and broadcast tv were all scrambling to copy the "Tunnel of Light" effect that electrified audiences in Kubrick's movie "2001: A Space Odyssey." For most of a year, you could NOT watch TV for an hour without seeing four or five commercials that used some approximation of the effect, it had so completely captured the imagination of the public. In the mid-70s, VHS systems dropped below $100,000.00 for a good set of camera, microphone and a reliable and reasonably mobile recorder for both video and audio. Many businesses that had been accustomed to hiring experienced filmmakers bought these new systems to do "in-house" production. For the next two or three years Independent producers took a big bruising hit, but eventually most of the businesses realized that just being able to see an image in the viewfinder didn't trump decades of professional experience. Then, computers the size of an industrial air conditioner came along that could create 35mm slides with vector graphics - super-saturated colors, geometric patterns, razor-sharp edges, crisp fonts. Shortly afterwards, desktop publishing applications were allowing users to select PostScript fonts and patterns and create reasonably clean and tidy typesetting. They no longer had to pay a big fat fee to have a commercial Lynotype or PCL service do their typesetting, bring it back to the studio and use hot wax and X-acto blades to paste the text onto a layout to be photographed by a room-sized camera at an offset lithographic printing company sprawling across an acre of brick and concrete. By the mid-80s electronic graphic boutiques were able to crank out shiny, sparkledy, spinning logos married to client-supplied stock video in a day or so. About the same time, Industrial Light and Magic took the camera control system that had rocked the world with 1977's original ''Star Wars" film effects and applied it to computer graphics, and systems like WaveFront, Alias, Soft-Image, Symbolics, and Vertigo 3D came to dominate the industry for a time. Right now, anyone can buy a computer and applications to create feature-quality 2D and 3D animation for far less than the cost of a new Mid-sized car, down from half a million dollars in the mid-1980s. My superficial recollection is of course a lot of crude over-simplifications. But the "take away" is that about every five years, there's been some new combination of technologies that have created vast upheaval throughout several connected industries. Companies founder, people have to scramble to learn new tricks and find a new job. For any student studying computer graphic methods, it is a certainty that the application versions they're learning now will be two or three versions out of date --- or completely supplanted by some shiny rival with go-faster pinstripes --- by the time they graduate. The point is that technologies will change, but the underlying principles of design and storytelling that follow from the way humans have always made sense of the world will continue to serve and reward people who master them --- composition, color, line, gesture, pose, staging, dialog --- all the elements that have made for compelling narrative for thousands of years. For about eight years, I've been giving students in my storyboarding classes a reasonably detailed floor plan showing doorways, stairs, windows and furniture, and one of several stories I've cobbled together from time to time. The Challenge is for them to decide on the story points they want to treat - ignoring parts of the text that are NOT visual, like smells. Then for their storyboard panels, they sketch a camera on the floor plan and show how its axis and angle of view relate to the actors, and try to do a simple sketch showing what the camera might actually see. In some stories there's activity outside, so I thought I should try some sort of treatment of the exterior and the surrounding countryside. That's a miniature of the floor plan at the left. This is an inspirational drawing as an example of using a fevered imagination in combination with the tools of Adobe Photoshop, a popular image manipulation software. 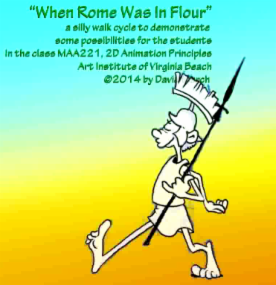 For ten years I've been teaching classes in Hampton Roads, using brief story set-ups for students to exercise both their imaginations and the various tools we study in different classes. This one challenges students to depict a meeting between a blacksmith and the client who is paying for a project. It can be a special weapon or a decorative gate, helmet, armor, goblet, or sculpture. They begin by researching images of blacksmith tools - the anvil, forge, clamps, hammers, and so on, from stone age villages to modern farriers who shoe racehorses. This sketch emerged from a series of demonstrations of various rendering techniques using Adobe Photoshop application. Sometimes students suggest challenges for the instructor. Every once in a while I respond, and it always gets me in trouble. "John Carter of Mars" from a few years back. and such. I had no idea what the blacksmith was going to look like. I guess I have to apply that same thinking to my software / drawing demonstrations. The Learning Company. 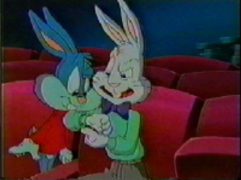 (You might be familiar with their children's series "Reader Rabbit.") One of the things I try to emphasize with students is the need initially to work FAST, so you can produce something early for your team mates, art lead, producer, creative director, or THE CLIENT to look at BEFORE you invest a huge amount of energy. Most places will trust that you can do good work - THEY HIRED YOU, RIGHT? So there are lots of times when the most important thing is to NOT keep everyone waiting while you do finished artwork ready for publication! The first sketches are the sort you would do in 20 minutes when you have folks waiting to see how you interpret their ideas. They'll look at these and either tell you to clean'em up, or make changes. The next treatment is how you might clean them up. It takes me a lot longer to do the clean up than to do the initial sketches, and that's pretty normal. But it's also normal to do a LOT of exploration, see how far you can take things to make a character come ALIVE, and be distinctive instead of just some stock type that shows up over and over again. One client asked me, "Well, since it takes longer to do those initial sketches, why don't you just skip all that and go directly to the FINISHED ARTWORK?" Next, Clean-ups, suitable for presentation for Investors, Bank Loan Committees, etc. I remember a film about British soldiers - "Zulu" I think - where the army surgeon was tending to a corporal with a boil. "Son, you might go through a whole career without getting shot. But there will ALWAYS be boils." 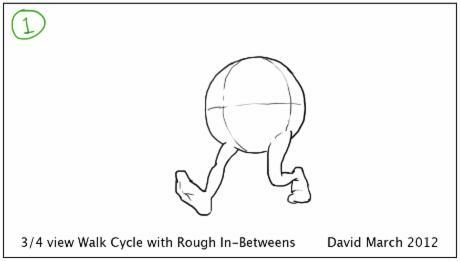 In a way, Walk Cycles are the inevitable lot of the animator. 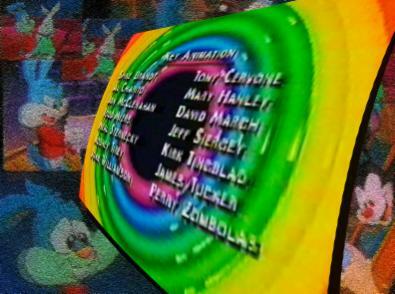 In a career of decades, any animator will be called upon to do dozens - no, SCORES - of walk cycles. You must learn to love them. 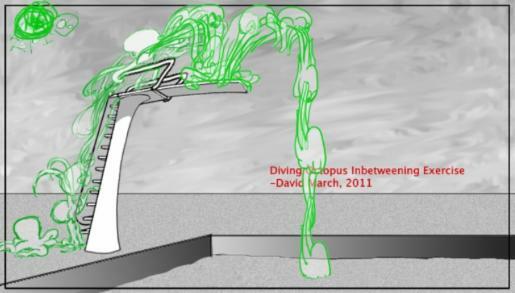 This Diving Octopus sequence is a good way to introduce students to In-betweening. Seeing the variety of solutions that WORK helps clarify just how much latitude a sequence can tolerate, so long as the lead animator's keys keep the model reasonably consistent. I still draw a lot of happy inspiration from some of the exuberant and demented animation from the 1930's, since my brother and I had a small batch of black and white silent reels of Mickey Mouse cartoons we were able to study over and over. Grocery stores in the late 30s and 40s sold them as PROMOTIONS just to get people into their stores. My dad had brought a WWII surplus projector that had been used by fighter pilots to study films from their gun cameras. It had a shield to protect the film from MELTING when you paused, and a tiny crank that allowed slow back and forth movement. Now all those are available on YOUTUBE - the great repository of human culture - but I still turn off the sound to enjoy the sequences as I did as a five-year-old. Here are a couple of Demonstration "Line-up Developments" I've done, at least partially in class, to show students some useful standard ways of developing Character Color Model presentations for clients and employers. 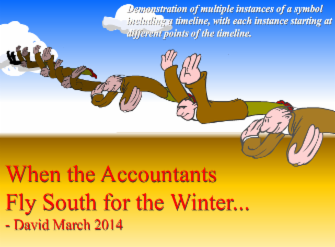 "When Accountants Fly South for Winter"
This silly thing was conceived as a demonstration of the possibilities in using a SYMBOL with embedded animation on its own internal timeline in the Adobe application Flash, which I started using about 1999. Each Suited Accountant flaps on a repeatable cycle (8 drawings, I believe.) But the group receding into the distance is actually just multiple iterations of the same symbol/animation, with each iteration sized, assigned a distinct dark/light setting, and set to start playing its sequence on a different starting point of its internal timeline. to plan and coordinate the movements of a bird, a snake, and a fish. Walk Cycles showing characters walking as if on a treadmill, can be almighty useful, and I demonstrate a lot of ways to employ them. 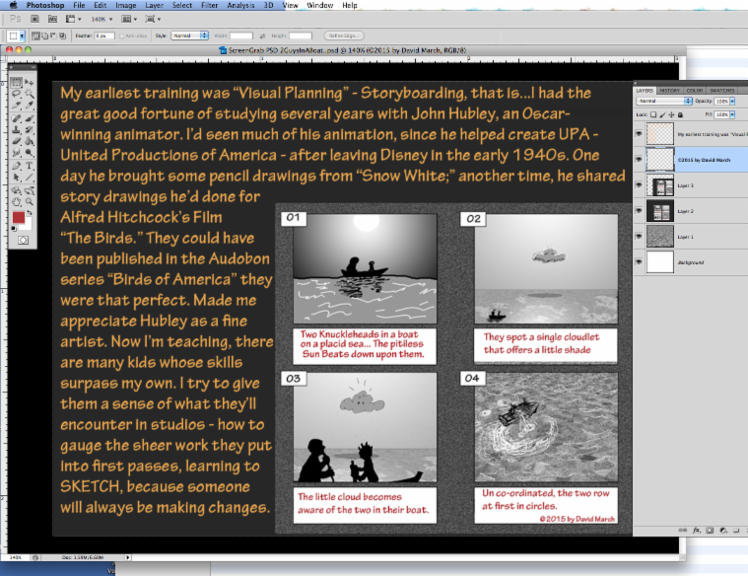 In this case, I was setting up a Storyboarding exercise which the students could eventually develop as an actual animation project with as many as seven or eight shots, so I was working in Photoshop, and eventually ANIMATED the walk cycle in Photoshop. At the Art Institute, we concentrate on Toonboom Harmony, an application that's about as complex and comprehensive for 2D production as Maya is for 3D. But I also show students how to animate on paper, and with various combinations of commercial software, including Adobe Flash and Photoshop. In addition, a number of them work with Premiere and AfterEffects. 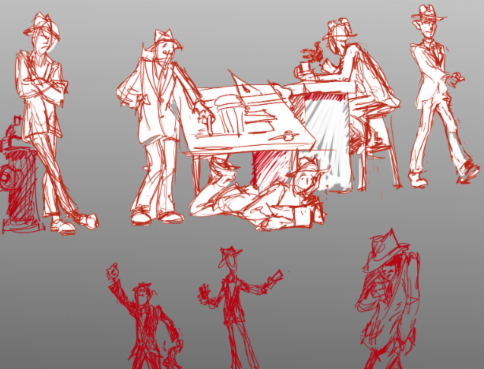 Anyhow, they seem to take some reassurance when I tell'em that the Roughs for this silly walk only took an hour, but the Cleaned-up drawings took almost that much time for each one! My experience has been that very few studios have the animators clean-up and paint and composite their own work; they have artists who are really GOOD at that! For this shading demo study, I included some of the floating windows from the interface of my home copy of Adobe Photoshop CS5. 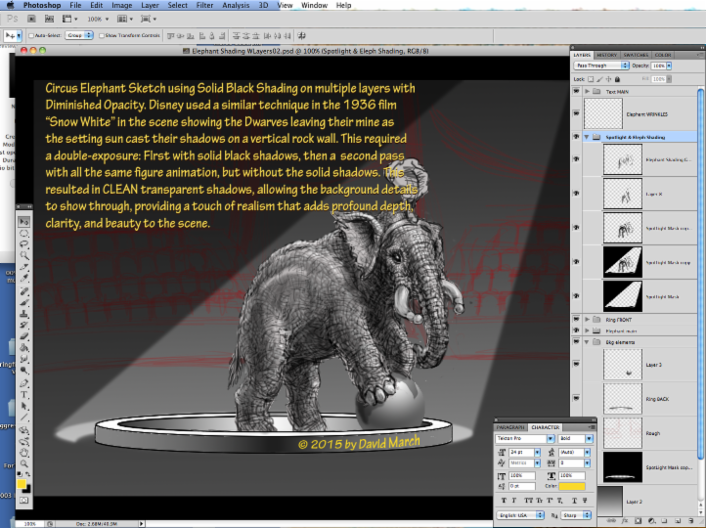 This is to show the full black shadows set at lowered opacity to create realistic shadows and light effects as an effective alternative to shading with "cross-hatching STROKES." It's a technique I demonstrate several times per quarter. This is meant to provide some alternatives that can be substantially faster than some techniques learned for drawing on paper. Here's a more recent 14-drawing walk cycle featuring a more "realistic" treatment (aside from having a black outlne around the person... Can't speak for anyone but myself, but it seems a dead give-away that it's artificial.) Similarly to the one above, I show the students some of my personal projects and 'splain how long it takes to do the clean-up art NOT to discourage them, but (a) to give'em a realistic idea of what's involved, AND more importantly - (b) to underscore that it's okay to include a few rough sequences with your tarted-up artwork. This tends to reassure some of us who've been in the industry that you actually know the process and workflow. Anyone who's produced 2D animation and viewed applications from graduates of USC, UCLA, Sheridan, and CalArts has seen plenty of senior projects consisting of Rough Pencil animation drawings with multiple bottom-lit layers synched to an audio track. Here's the same basic art of the naked guy walking. As you can see, getting all the muscle systems shaded is a challenge. The sad thing is that each of the fourteen drawings seems to ME to look like a DIFFERENT GUY. Some have longer arms, others have shorter legs, and some seem a little small. Some day I'm going to spend some real time just drawing, till I can get to the bottom of this craft. I generally start without the complications of a costume, just because I can't figure out how the cloth, or armor, or toolbelts, or boots fit on the body without have a body to work with. Usually I don't need to include all the details, but This time with Colonial-era costume, on a Wharf with crates and barrels, warehouses and a small ship moving with the waves. I used this to explore the $300.00 dollar mid-level animation software made by TOONBOOM that I have on my personal computer. At the Art Institute, the version of Toonboom we use to train the students in 2D hand-drawn animation is their premier version, Harmony version 12, with as many tools and features as any top-tier 3D modeling and animation application. Of all the animation computer applications I've used or seen demonstrated, this one is the closest to the workflow of traditional animation I learned in the 70's. 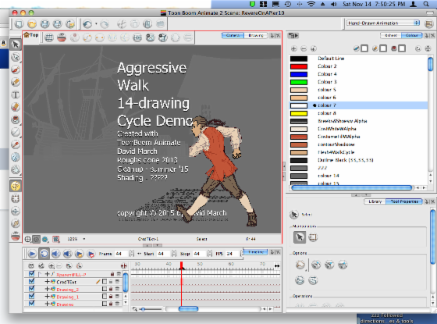 Here's a link to the animation of "Revere on a Pier"
Cycles have so many applications, I try to share a number of treatments. I've animated several turning waterwheels over the decades, and the very first - done with traditional cels from pencil drawings - showed me that rotating objects that have internal symmetry can be treated with GREAT efficiency. You Don't have to rotate them through the full 360 degrees! Yahoo! Another almighty useful technique - moving line segments. with a minimal number of distinct drawings - THREE, actually. With two, you just get a back and forth twitch. Three images are needed to create a directional flow. Hmmm. Someone is bound to show I'm wrong, I bet. At the Art Institute, I get a chance to get students in the habit of using storyboarding from their earliest classes. 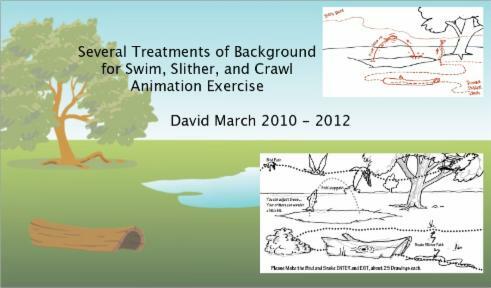 Although there are a few hold-outs, most students do story planning sketches for most of their 2D projects, and a lot of their Maya and AfterEffects projects as well, after they see how it helps make the process more rational. One Photoshop trick I share with them is to create a lot of layers filled with translucent white, allowing them to sketch a figure with a dark outline that then immediately has a fill. Select and delete the white outside the figure, and save lots of time. 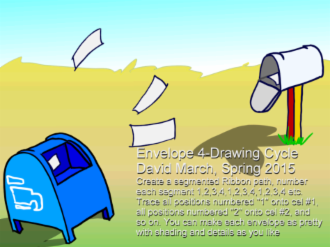 Once you get the hang of it, you can even do quick animation, as shown in this GIF image. 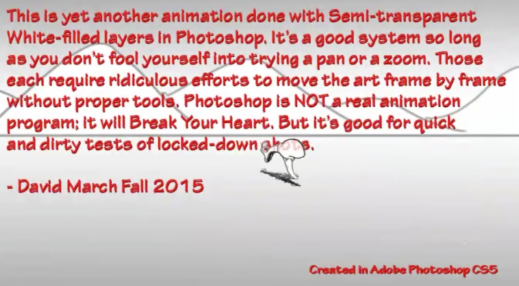 Just don't expect to do pans or zooms in Photoshop; they will leave you frustrated and very annoyed. using layers pre-filled with 40% opacity white. I calls it "Galloping Snertie"
And of course, Horses are so darned beautiful, I can't resist'em any more than puppies. Flash lends itself to some wonderful tricks with multiple nested animating symbols. By offsetting duplicate limbs and setting their timelines to different starting points, you can get some reasonably graceful gallops. For your entertainment: My portfolio / website design from a few years back. Contact information in here is WAY out of date.